Shibori jacket in red and black with beautifully embroiderd cats all over and has a beautiful inside silk finish. Owing to the expertise of our skilled team of professionals, we are engaged in offering an exclusive range of Men's Jackets. 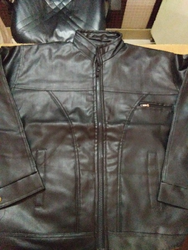 These jackets are designed by highly skilled designers using supreme class fabric & other raw material with advanced techniques. These jackets are used in showroom, malls, houses and any wear places.